The Intelligence Trap by David Robson (Hodder & Stoughton. Hb, £20); reviewed by Dr Eva M. Krockow. What do Albert Einstein, Arthur Conan Doyle and Thomas Edison have in common? All of them were ground-breaking geniuses, of course. Einstein spearheaded modern physics, Conan Doyle created brilliant fiction, and Edison developed the light bulb as well as 2,331 (!) other patented inventions. However, their astronomical IQ isn’t the only similarity. Despite their incontestable intelligence, all three of them held seriously misguided beliefs about major aspects of life. Did you know, for example, that Conan Doyle believed in fairies? When I first picked up The Intelligence Trap, I did so with a sigh. Following the global success of Thaler and Sunstein’s introduction to nudge theory, the growing number of international bestsellers based on Tversky and Kahnemann’s dual process theory, and increasing public interest in cognitive biases promoted by works the like of the The Art of Clear Thinking, I was less than enthusiastic about the prospect of reading yet another book on the psychology of decision making. Haven’t we had enough of those? I changed my mind only four pages into the Introduction. Right about the time I came across a deceptively simple cognitive reflection task… and failed to solve it. The Intelligence Trap challenges our traditional, narrow, assumptions about brainpower. Indeed, the author David Robson argues that a high IQ alone is not predictive of smart decision making and overall life success. While changing the way I think about intelligence, the book also forced me to reflect about my own brains, resulting in the somewhat painful realisation of my personal limitations. For example, it highlighted my humble levels of practical intelligence (evidenced by regular struggles with the washing machine). Furthermore, reading about the dangers of emotional reasoning, I came to accept that my recent impulse buy in the winter sales may not have been the wisest choice. Thankfully, Robson offers hands-on advice on how to avoid such mistakes in the future. To counter impulsiveness, for instance, self-distancing and emotional awareness may help. This can be achieved by talking about yourself in the third person or by speaking in a foreign language. So don’t think I’ve gone mad if I end up muttering to myself in French! Robson uses many historic examples and creative analogies to make this point. Comparing the human mind to a car engine, for example, it becomes intuitively obvious that mere engine power (i.e. intelligence) does not mean you’ll arrive in the right place. 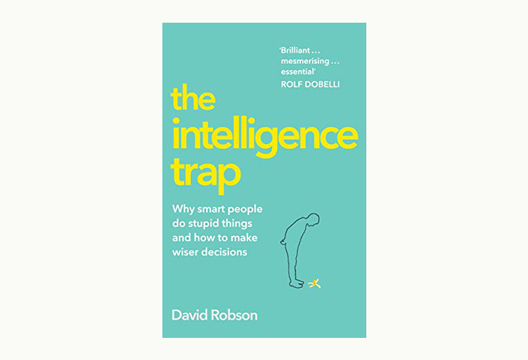 Indeed, Robson argues that high intelligence might get you places quicker, but if you’re headed in the wrong direction, this could lead to detrimental outcomes. Are you a Ferrari going round in circles? Or a Porsche headed for a cliff? You might want to give this book a try.